Ideally located on the beach front of Torremolinos in the Costa del Sol area of southern Spain, Hotel Puente Real brings you the best of Andalusian hospitality with top-class services and amenities. The hotel has 371 ultra-comfortable rooms and 102 Andalusian-styled apartments with gorgeous sea views. The apartments are well-appointed with spacious bedrooms, living quarters, en-suite bathrooms and kitchens. The in-house restaurants of the hotel also offer stunning sea-views, alongside scrumptious buffet spreads and live cooking shows. There are two expansive swimming pools to cool off, while separate swimming areas for kids keep them happily busy. With pool bars, mini-clubs, indoor cafeterias, TV areas and daily day and night entertainment for adults and children, the hotel will make sure that you have a great time on your holiday. There are also private parking and Wi-Fi, both of which can be used with a small fee. The resort is great for outdoor sports such as windsurfing, sailing, kitesurfing and diving. If you are looking for family-friendly fun and affordable luxury in Costa del Sol, Hotel Puente Real is your go-to place. 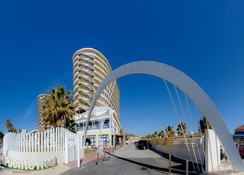 The hotel is located right at the beach front of Torremolinos in Costa de Sol. 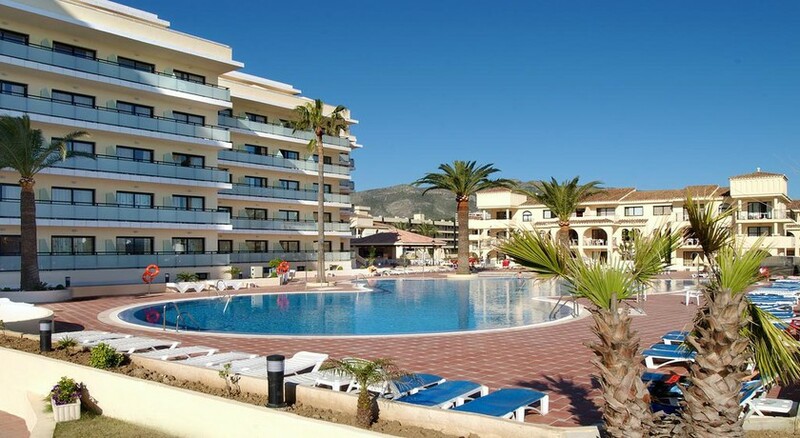 It is quite near the Malaga airport in Costa del Sol, which is located at a distance of 4.2 km. It takes around 8 minutes to drive down to the hotel from the airport. The famous beach of Playa de Guadalmar is located at a distance of 8.6 km. All the rooms in hotel are well-appointed with a cool Mediterranean vibe. Decorated in the shades of blue and white, the rooms come in three types: superior rooms, double rooms and apartments. The superior and double rooms have stunning sea-views with a host of facilities such as en-suite bathroom, TV, hair dryer, safe, refrigerator and Wi-Fi facilities. Guests are also served with water and wine on arrival. The apartments have, in addition, sofa-beds, living area, kitchen and plenty of other features. The main restaurant of the hotel serves lavish buffet spreads featuring an array of local dishes and international fare. Restaurant Italiano La Farfalla offers the best of Italian cuisine, while the pool bar serves delicious cocktails right at the pool area. Hall Café serves freshly brewed coffee and tea during the afternoon. For this reason, we inform you that for these dates 15th June till 15th of September, our apartments will not have a kitchen (it will be closed). The apartment will have : 1 bedroom, 1 living room with 2 sleeping couches, fridge, bathroom and balcony. From 2019 the apartmentes will not have a kitchen. that the restaurant is closed and until 7:00 p.m.
7. Sports included: gym, table tennis, petanque, archery, tennis, aerobics ..
9. A maximum of 2 drinks and plates of food will be served per person in each order. norm, the bracelet will be removed together with the imposition of a sanction. 5. Animation during the day and night for adults. 7. 40% discount on the price of imported beverages. 8. Maximum of 2 drinks or snacks per person each time. 9. Not allowed to invite other customers. Otherwise, we have the right to leave you the bracelet. Second visit to this hotel , great location rooms clean and spacious. The Resturant has excellent choice of food to suit everyone. Did not use pool because beach is just across the road. Great area for walking nice and flat also great shopping . One of the best hotels I have been too! Amazing hotel and great value for money. Very friendly and polite staff. Would highly recommend. Only a short journey from the airport, by private mini bus. It comprises of the main building with a further building to the side which overlooks the pool. Then there are further blocks for self catering. It is very clean & the staff very welcoming. Great children's entertainment throughout the day & evening. Again the staff are brilliant with them. Hotel is situated at the end of the long prom. Torremolinos shopping centre is just a 20 minute walk away. Close by there are lots of eateries, shops etc. The beach is just across the road. Getting around by public transport is easy & cheap. I went here for my Hen Do was a lovely hotel and great location.